Carte des Parties Nord et Est de l'Asie qui Comprend les Cotes de la Russie Asiatique le Kamschatka, le Iesso, et les Isles du Japon. A map of the Northeast Passage, the northeast coasts of Asia, and the American Northwest. The Northeast Passage, much like American's Northwest Passage, was a long sought after sea route through the Arctic that would save European merchantman the expense of rounding Africa in order to access the trade riches of East Asia. This map deals primarily with Asiatic Russia, detailing the Northeast Passage from Norway and Iceland westward as far as Alaska (Anian), Kamschatka, Yesso, and Japan. Knowledge of this area was, at the time, speculative at best and this is reflected in the map. Shows many unknown islands, misshapen representations of Kamtschaka, Japan, Hokkaido (Yesso), and Alaska. Notes Peking (Beijing), Nanking (Nanjing), Corea (Korea), Jedo (Tokyo)and Nangasaki (Nagasaki). The four inset maps of America depicted in the lower left-hand quadrant are of special interest. All four loosely reference Wytfliet's seminal 1597 American Atlas. The upper left inset (I), depicts the northwest coast of America from the Bay of California to a conjectural Alaska, a misshapen Japan and a mysterious I. de Plata. Depicts the mythical city of Quivira on the Alaskan coast. This map was based upon the California sheet of Wytfliet's Atlas. Inset (II), also drawn from the Wytfliet California, shows the Bay of California and Nova Granada. Plate (III) depicts the Conibas-Zubgara region. This region, which appeared first in Mercator's 1569 atlas has been loosely interoperated, depending upon the source, as the Northwest Passage, the Hudson Bay, or the first map of the Great Lakes. 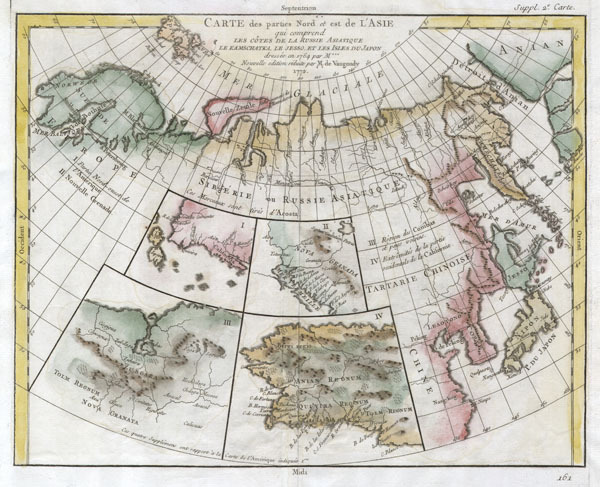 Plate IV shows what is almost certainly Alaska, labeled Anian Regnum. Here is a real cartographic curiosity, where myth become fact, which again becomes myth. Anian is a term derived from a John Donne poem, 'Anyan if I go west by the North-West passage.' However, it was interpreted as the Bering Strait by cartographers, successfully transitioning it from the realms of poetry to cartography. Anian presupposed the existence of a Northwest Passage and, as such, was entirely mythical, though the lands that are now Alaska long bore that name. This map is part of the 10 map series prepared by Vaugondy for the Supplement to Diderot's Encyclopédie, of which this is plate 2. This seminal map series, exploring the mapping of North American and specifically the Northwest Passage was one of the first studies in comparative cartography. Very good condition. Original centerfold as issued. Gouge in margin at original centerfold not extending as far as platemark. Platemark visible. Blank on verso. Pedley, Mary Sponberg. Bel et Utile: The Work of the Robert de Vaugondy Family of Mapmakers. 406.